With Prince Harry and American actress Meghan Markle’s wedding approaching this May, royal weddings and love stories are on everyone’s mind. This love for the royal family is nothing new though. For decades the public has come to admire what royal weddings embody around the world, especially when it involves an unlikely couple getting together for a fairytale ending. That’s why I’m loving this visual from Invaluable that shares different and unlikely royal love stories from around the world. No matter their background or social standing, it goes to show just how powerful true love is. 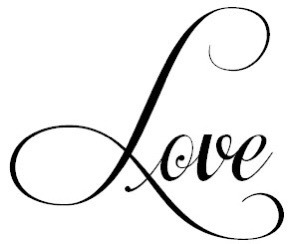 From Prince William and Kate Middleton meeting in their college dorm to Grace Kelly and Prince Rainier III meeting at a photo shoot, the love stories behind these iconic couples is inspiring to follow, especially during the month of love! 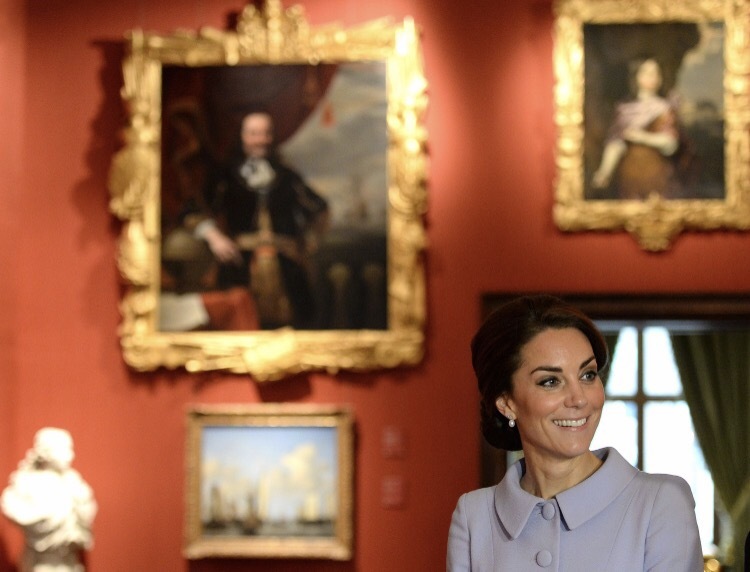 Recent engagements of The Duke and Duchess of Cambridge have been in Berlin, Germany. 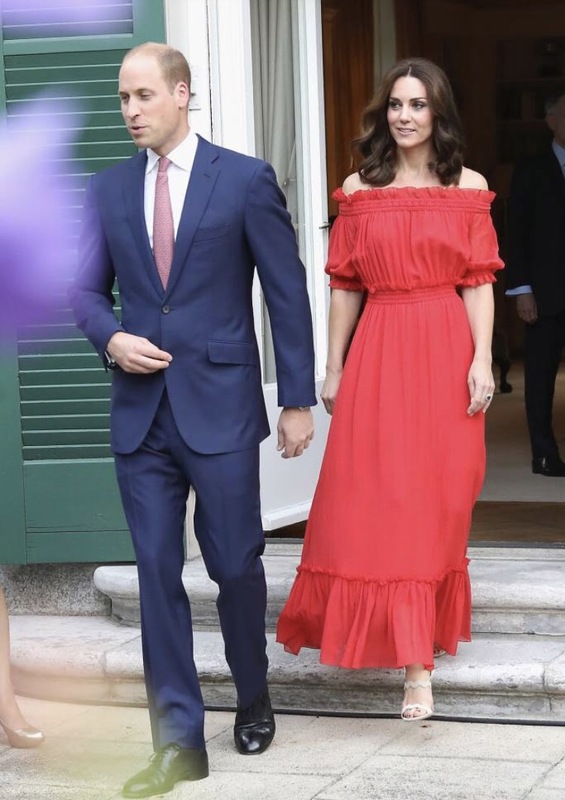 Kate, 35, wore a chiffon maxi dress by Alexander McQueen, down from £2,075 to £1,453. 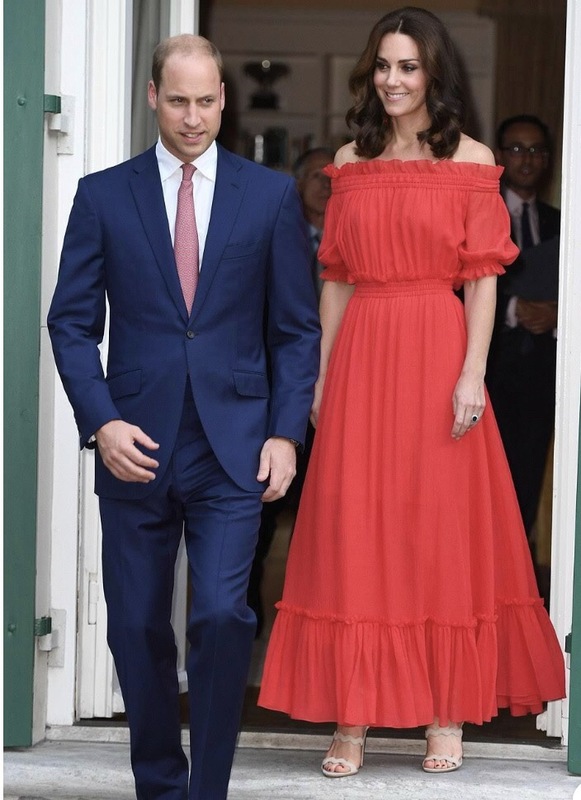 The Duchess of Cambridge beamed and glowed in a voluminous red gown and a pair of Prada shoes 👠 which she wore to the Natural History Museum in London last week at a party held in honour of the Queen’s birthday. There is a replica on Net-a-Porter, the Alice and Olivia off the shoulder embroidered cotton maxi dress which is $580. I think she looks absolutely radiant! 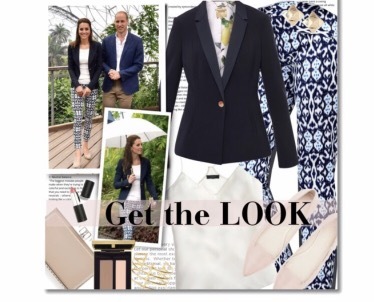 Kate had a change of outfit from her busy day of engagements in Berlin. After their arrival in Germany, the Cambridges attended a garden party to celebrate The Queen’s birthday. 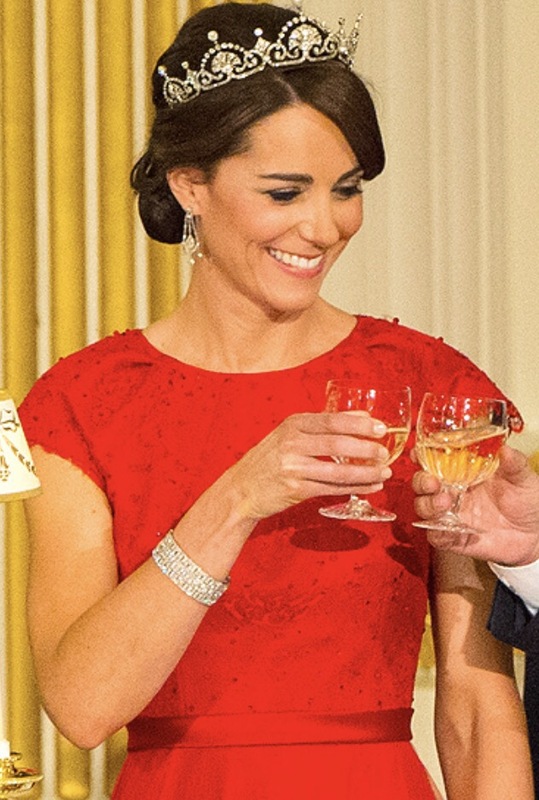 The Duke of Cambridge spoke at the Occassion, and the Duchess in attendance raised a toast as Prince William spoke. He began (and finished) his speech with a piece of German as a show of respect for Germany. “Thank you, Ambassador, and good evening, ladies and gentlemen. “It is a pleasure for Catherine and me to be with you on this occasion as we celebrate the birthday of my grandmother, Her Majesty The Queen. 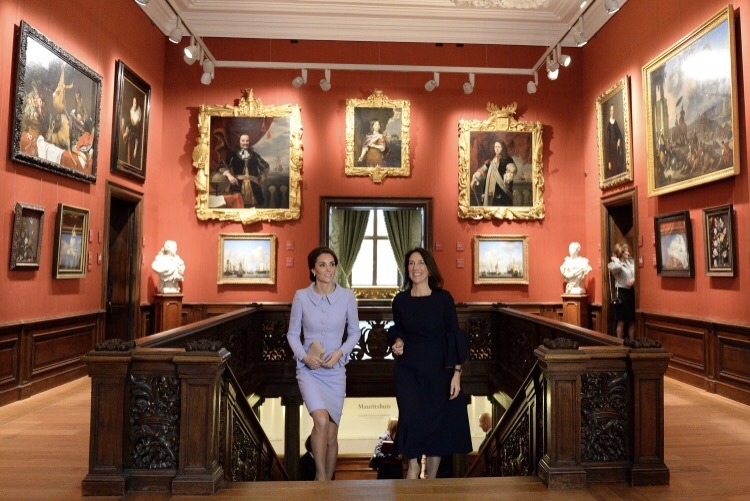 “It is just under a year since I was last in Germany, to celebrate the 70th anniversary of the state of North Rhine-Westphalia and Britain’s role in its creation. 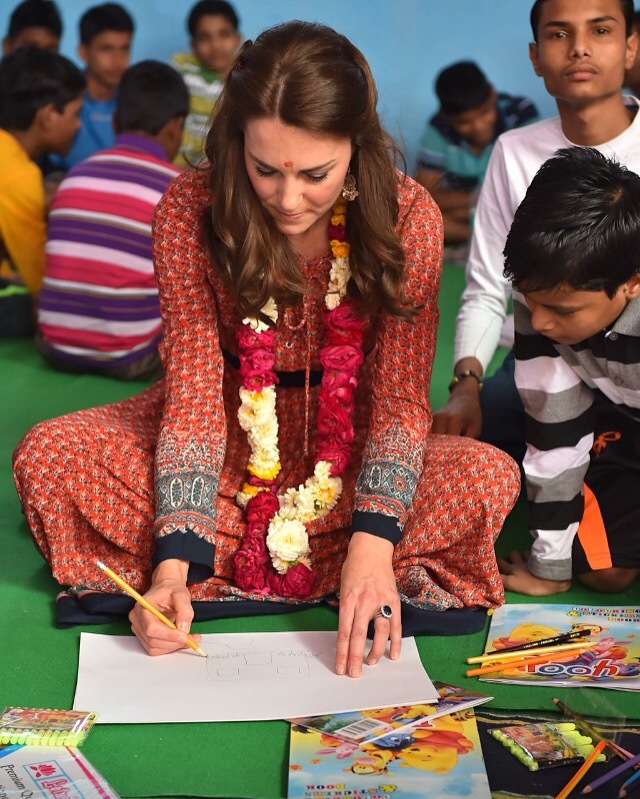 I am delighted to be able to return so soon – this time with Catherine, George and Charlotte. “We have already had a fascinating first day here in Berlin. We have seen powerful symbols of the historical events which helped shape modern Germany and spoken with those who carry that legacy forward today. I thank President Steinmeier and Chancellor Merkel for welcoming us so warmly. “We have also experienced the city beyond the monuments and corridors of power. This afternoon we visited the Strassenkinder project in east Berlin, which supports homeless children and young people. 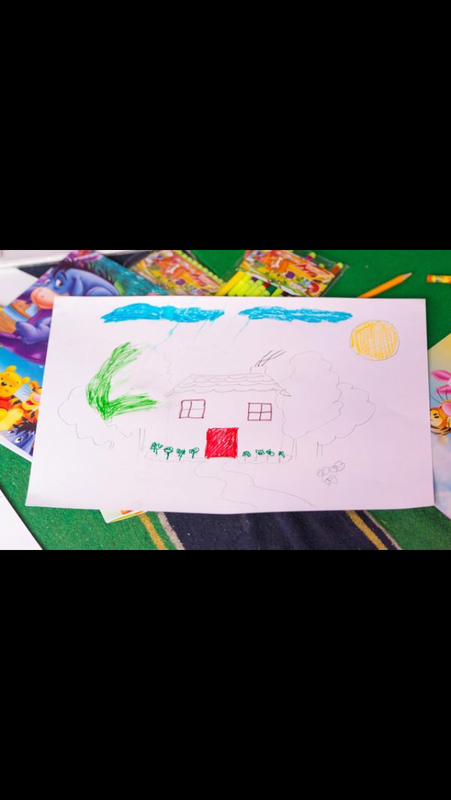 It reminds us of the difficulties faced by some of the most vulnerable people in society, even in prosperous countries such as Britain and Germany, and the value of both countries looking at examples of best practice in the other. We look forward to seeing more of this great city during our stay here. “But we also want to get to know and understand Germany outside the capital. Tomorrow, we travel to Heidelberg, and on Friday to Hamburg. “Our visit will reflect, and I hope reinforce, the strong and wide-ranging ties between Britain and Germany. These include political, cultural, historical, commercial, sporting, academic and scientific links. “The United Kingdom and Germany proudly share the same values as open and democratic societies, and the same determination to champion those values and to defend them – not least through our very close defence and security partnerships. Today, we share a fundamental interest in the peace and prosperity of the continent of Europe to which we both belong. This relationship between the United Kingdom and Germany really matters. It is the product of many years of working closely together. It will continue despite Britain’s recent decision to leave the European Union. I am confident we shall remain the firmest of friends. “With this confidence in mind, I am particularly pleased that the British and German governments have agreed to double their funding of UK-German Connection, the bilateral initiative for school and youth links. UK-German Connection was established after the State Visit of The Queen to Germany in 2004, and it provides a wide range of UK-German activities, networks and funding for schools and youth groups. The youth of today are the leaders of tomorrow, and we want to establish friendships between our young people that will last a lifetime. “Prince Philip and I send our warmest good wishes to all of you gathered for this special Garden Party, on the occasion of The Duke and Duchess of Cambridge’s official visit to Germany. 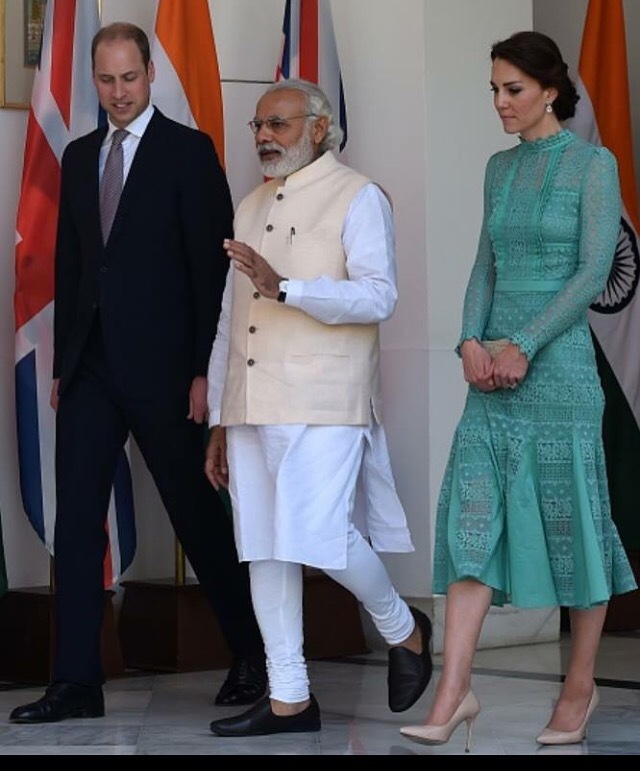 “We have fond memories of our five State Visits to Germany, from our first in 1965 to our most recent in 2015. Over the course of those fifty years, British-German relations have thrived, allowing us to face the challenges and embrace the opportunities of the 21st century together. 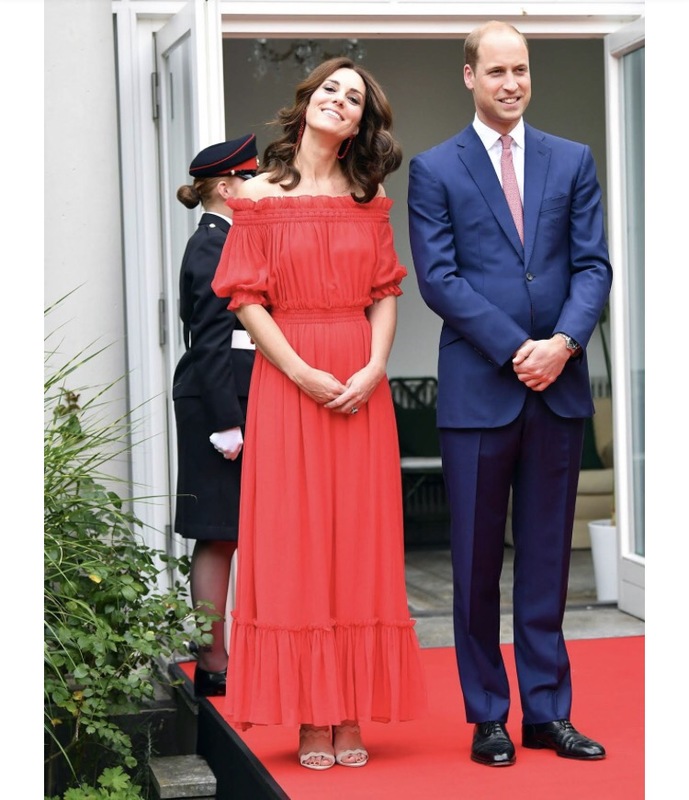 “I am delighted that The Duke and Duchess of Cambridge will experience the beauty of this country and the warmth of its people when they visit Berlin, Hamburg and Heidelberg. “I hope you all have a most enjoyable evening. Angela Merkel welcomed them when they first arrived at the Holocaust memorial to pay tribute to the millions of Jews which lost their lives. Kate looked sophisticated in a blue Catherine Walker coat which she styled with Gianvito Rossi heels, a Jimmy Choo clutch bag and Kiki McDonough jewellery. This is a five day tour of Poland and Germany also with their children, Prince George and Princess Charlotte, which I am doing a post on Charlotte soon! 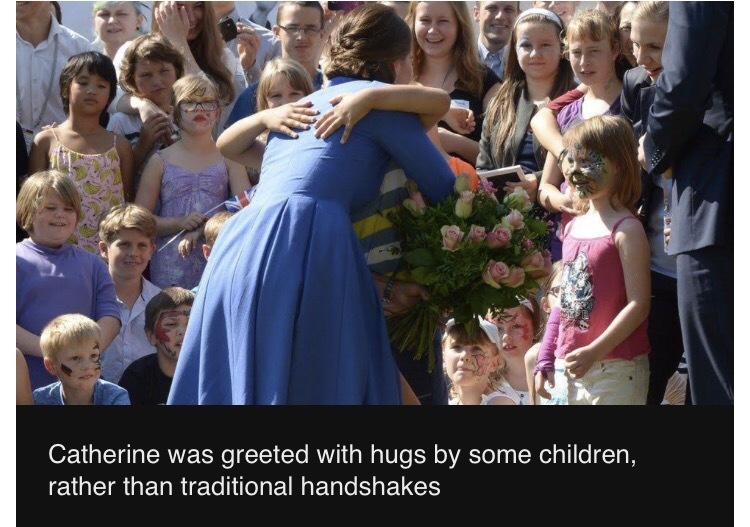 Catherine, The Duchess of Cambridge recently went on her first ever Solo Trip to the Netherlands on a one-day trip without her husband, Prince William. It is her first time travelling overseas on official royal business without William and her engagements were to be at The Hague and Rotterdam. 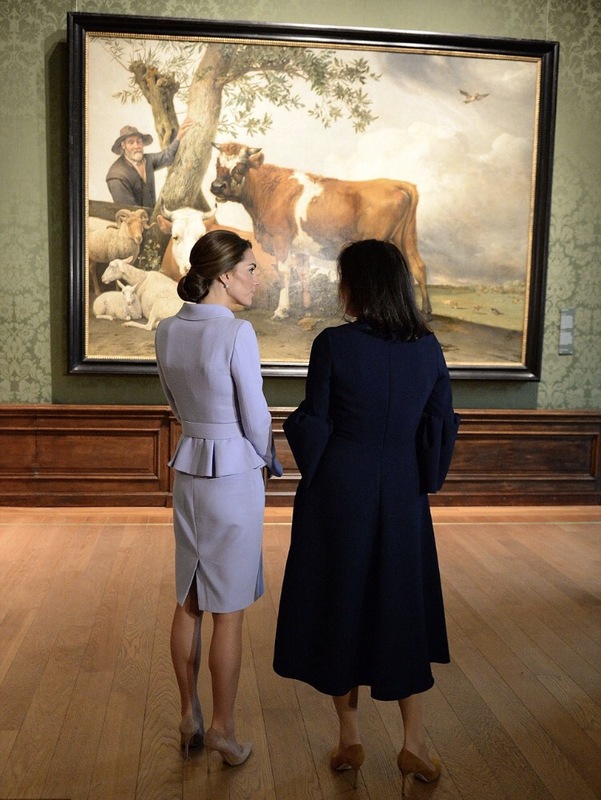 Catherine’s first trip included a tour of the Mauritshuis museum in the Hague, where she had lunch with the King, Queen Maxima and their three daughters at their royal residence. 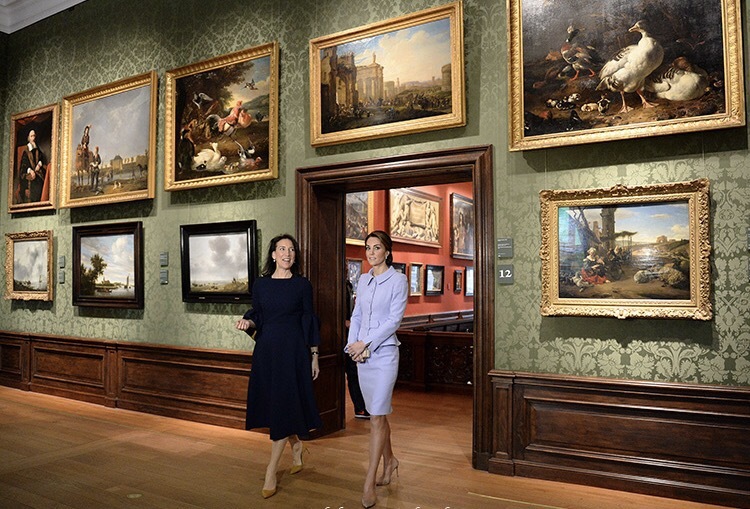 After lunch, Catherine visited the Mauritshuis Museum where Catherine surveyed and inspected twenty-two paintings that were on loan from the British Royal Collection. Emilie Gordenker was one of the museum directors and she stopped to have a chat with Catherine and the children, whilst the children were lined up in the streets waving their Union Jack British flags. All the children were assembled in a line ahead of three traditional British red telephone boxes which were constructed for the exhibition. What photographers loved to shoot was the stunning photo of Catherine, who stopped to pose in front of the famous painting, Girl with a pearl earring, which was originally painted by Vermeer. To me, this is a remarkable beloved iconic picture which represents a stunning appearance of her. 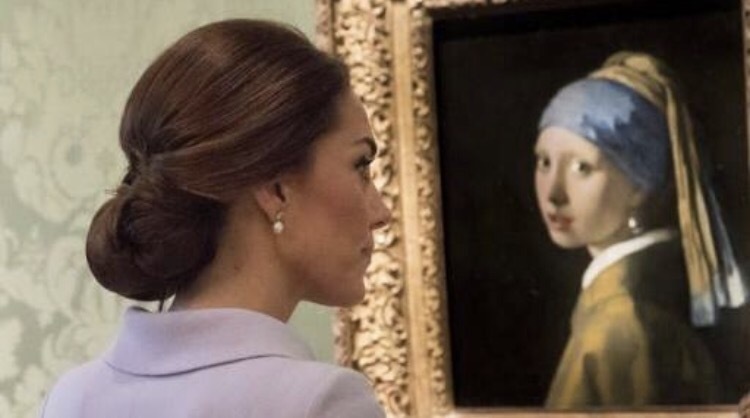 Catherine showed much interest in the painting, and Ms Gordenker apparently said “She didn’t mention the earrings she was wearing” which showed she was more interested in something else other than her own appearance. Catherine asked Emilie if the painting had become more popular since the film came out, and Emilies response was “It definitely had”. This is Emilie in this photograph below. Catherine’s last enagagement of the day was visiting Bouwkeet which is a district in Rotterdam. Catherine also helped fix a bicycle wheel there with two teenagers which was a workshop and pupils took part in a robotics class during the visit to De Boukweet Work Space – it is an initiative which is community based where Boukweet is a financially disadvantaged, and needy area. The work involved really helped the community and Catherine knows how to get her hands working, when it comes to helping others. This is why I believe she is such a fantastic role model for our current generation. She is not only poised, but is smart, intelligent and knows how to work with purpose. I mainly got most of my information from the latest Royal Life Magazine, which if you get the latest copy it is $9.95 in most Australian news agency’s. I used to have them put aside for me in Merredin, but now that I am in Perth, I have had to find them for myself, as it is a different and wider demographic. I got this copy in Floreat Forum, as Scarborough doesn’t have them. I am thinking of doing a piece on the family’s engagement when they went to Canada, but this engagement really stood out to me, as the pictures of Catherine are just stunning, and I am most particularly interested in oil paintings. 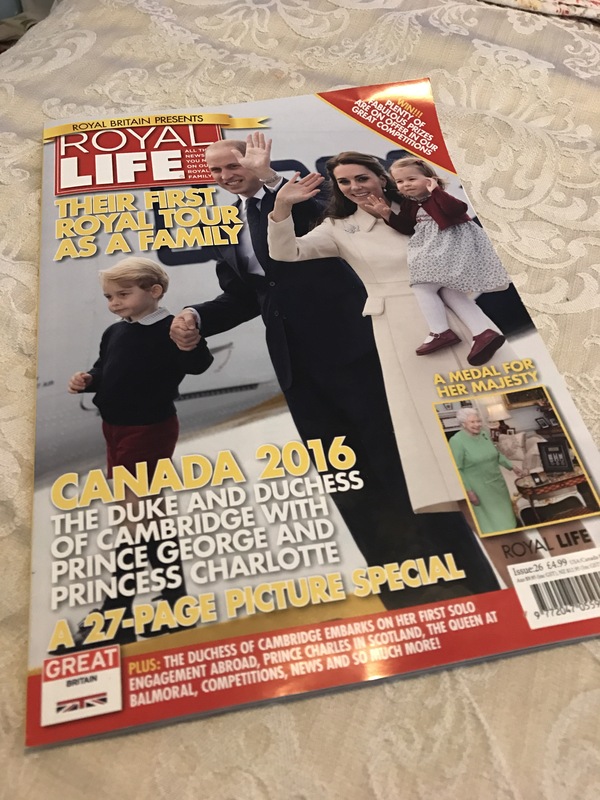 So, grab your copy, and sit back, and catch up on all the latest on Royal Life News. I have loved my copy of British Vogue’s issue of 100 years in FASHION. The one with Kate Middleton on the front is the June Issue, but by far it is my favourite British Vogue magazine. I have about three books on Kate, and have read quite a bit about her the past few years. 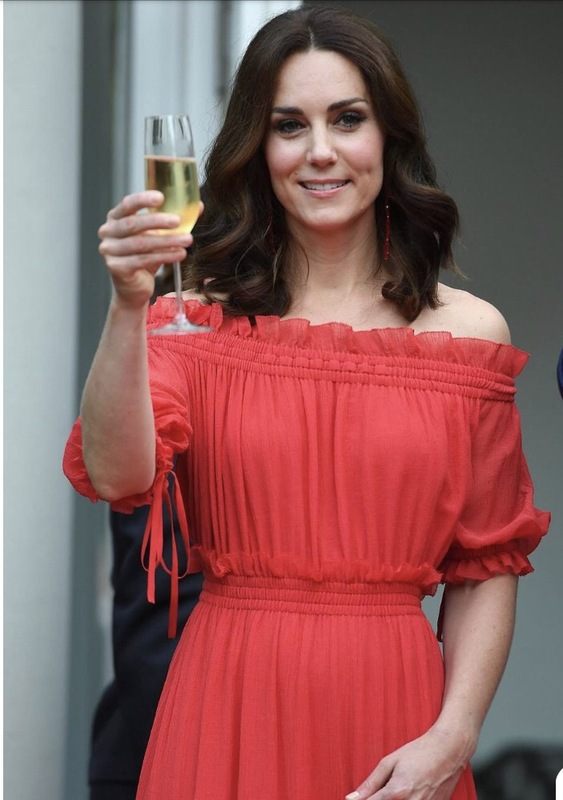 Katie Nicholl is a journalist/author/royal correspondent that I follow to get information on the Royal and she gives lots of detailed information on upcoming events such as the Tour that is going to happen in Canada very soon! 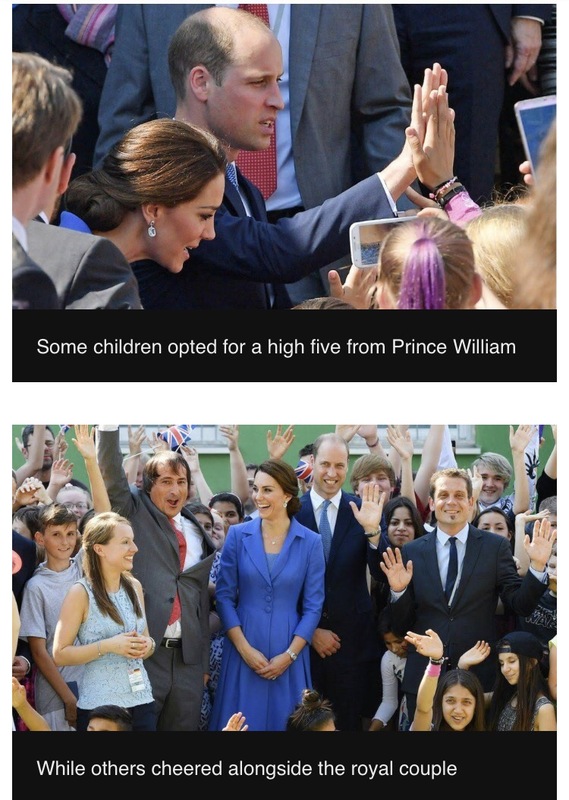 They will be visiting Kelowna and apparently are planning on taking little George and Princess Charlotte along with them. You can find their recent work on the Vanity Fair website as well which has LOTS of information on where and when they will be doing engagements. If you want to read about Kate Middleton I suggest you buy the book, KATE by Katie Nicholl herself! It is the BEST book I have read on her and I absolutely loved it and I have uploaded a picture of it on my Instagram a little while ago, when I first started becoming a Kate fan! Go to Katie Nicholl’s website for MORE details and coverage! She has all the latest news on her! You learn a little bit about the commoner turning royal, and where she was brought up and what she did with her parents, etc. 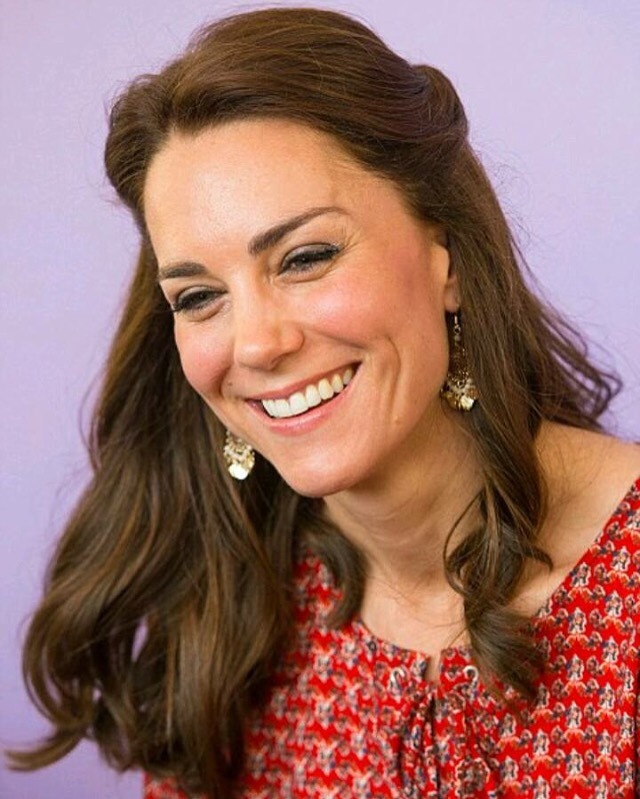 We all know her parents, Michael and Carole Middleton who became millionaires from launching their business, Party Pieces and Carole was a former flight attendant that then turned into a businesswoman. I did a whole bibliography on Kate for my subject on Applying Information Services. It had me hooked! 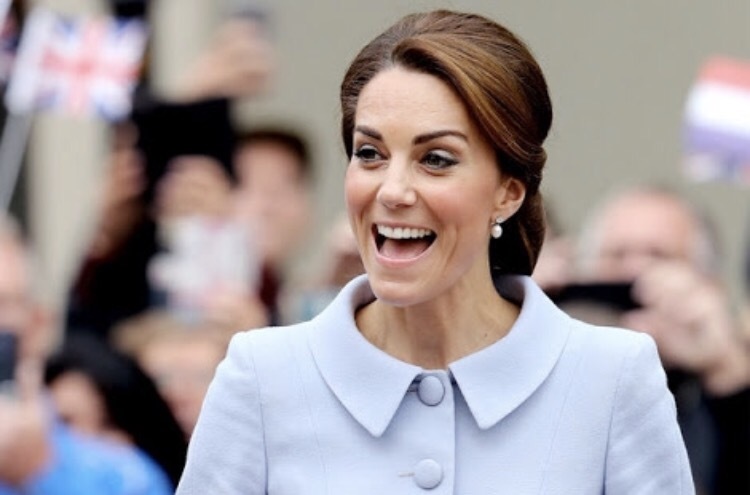 and I loved referencing off many websites that also have a love for the Duchess. Growing up she lived a normal easy-going childhood, and was born in Reading, and grew up in Berkshire. She now resides at Anmer Hall with her beautiful family, and I was quite blessed to receive two replies from her in the past year! This is when she was 3 years old on a family holiday in the Lake District. and this was Catherine when she was five years old. 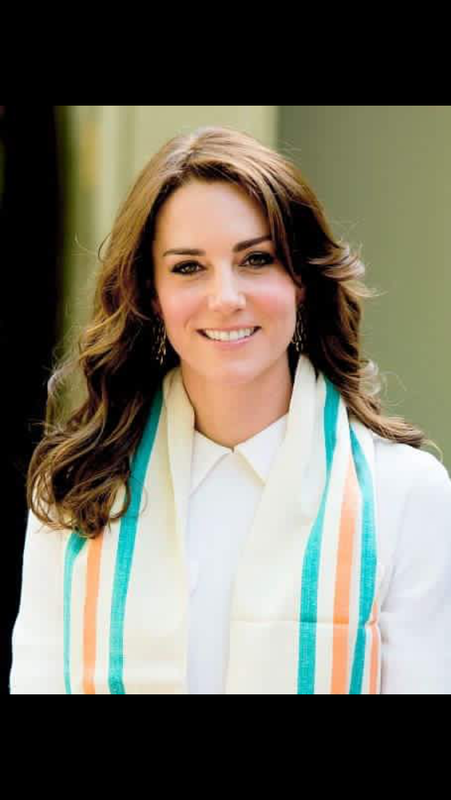 Catherine Middleton, graduated at St. Andrews in an Arts History degree on June the 23rd 2005. I find this fascinating as I want to do an Arts History degree specialising in Ancient History! This was her on her graduation day. Also, This was her on her 25th birthday. 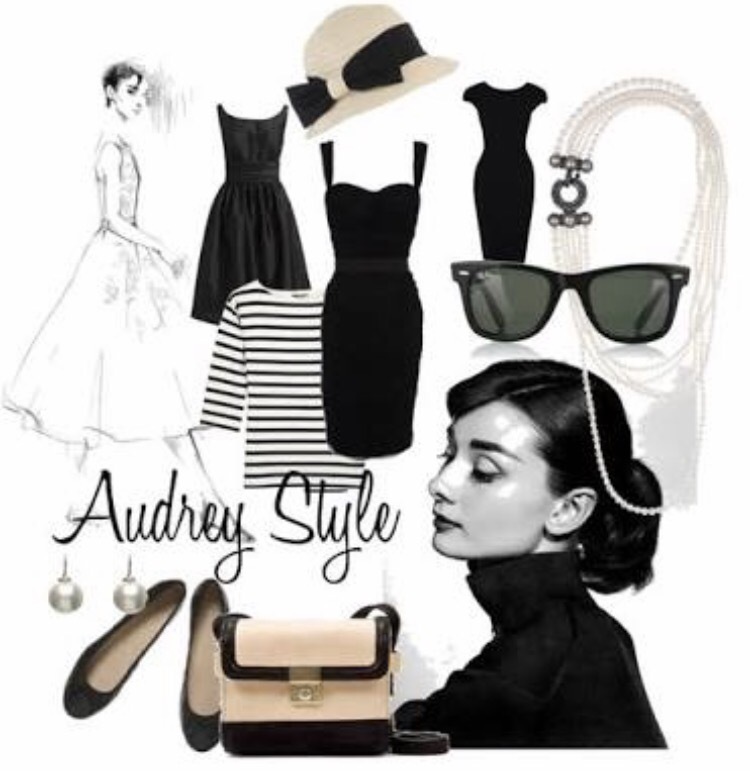 You can go to Vogues looks of fashion this year and eye out what she wore to every event! There are more photos and a whole timeline of her fashion. I particularly liked this dress she wore at her latest solo public appearance as its a soft grey and doesn’t look dull but neutral at the same time. It is a peplum styled dress and she decided to part her fringe instead of having it all at the front. This was when she visited the Send women’s prison with the Rehabilitation of Addicted Prisoners Trust (RAPt), an addiction charity that works to help prisoners addicted to drugs and alcohol. She learned about the role that addiction has played in the prisoners offences. “I was reminded today how addictions lie at the heart of so many social issues and how substance misuse can play such destructive role in vulnerable people’s lives,” she said. “I saw again today that a failure to intervene early in life to tackle mental health problems and other challenges can have profound consequences for people throughout their lives. This was her second public appearance after giving birth to Charlotte, who is now 1 year old! Now I just have to COO over little Charlotte – everyone has seen this gorgeous picture of her at six months, and there has been newer photos, but I just LOOOVE this one!!! She is a CUTE little thing! and I think it is sweet what they named her! Charlotte (feminine version of Charles) Elizabeth (After Elizabeth II) Diana (After Prince Williams mother). and I can’t wait to watch her grow up, and maybe give future speeches!!! and hear how she sounds! I am sure we are all looking forward to future events, and you know I AM!!!!! Today I am going to try and find some new replica dresses online as I only have ONE!!!! yep!!! How unlike me! It can be a little hard trying to find the perfect size, and not being able to try them on, but the Issa Bird Print dress I’ve got was a perfect fit, so will be eagerly looking for more!!! For posts on my replica’s, check out “Feminine Fashionista” or the “Issa London Blue Bird Print Dress” or have a look at Real Replikate to see my FAVOURITE replicate dress!